Mass media headlines tend to focus on the ghastly events of the day, leaving longer term and more positive developments to slip by unnoticed. This week a couple of my favourite thinkers have popped up on the media. Hans Rosling is a Swedish doctor, epidemiologist and statistician whose videos are a joy to watch with beautifully presented graphics. A few days ago the BBC gave him a one hour slot to show why eradicating global poverty is a realistic, achievable and necessary policy goal. It’s well worth watching the whole programme on iPlayer: ‘Don’t Panic – How to end poverty in 15 years’. Amazing the achievements of recent history, and so little reported as ‘news’. Stephen Pinker writing in the Guardian Weekly updated the arguments he made in his 2011 book ‘The Better Angles of our Nature’ showing that all forms of violence, from wars to homicide and domestic violence, all seem to be in decline. Of course these positive trends could all too easily be reversed, but they could also be accelerated, it’s largely a matter of political will. The United Nations Sustainable Development Summit was held over the last few days in New York. Media coverage has been minimal. The 17 goals the UN hope humanity can achieve over the next 15 years are powerful and important. Read the full list on the Global Goals link below. The list includes ending extreme poverty and hunger, tackling climate change while providing clean and affordable energy for all, tackling inequality, promoting education, opportunities and access to decent work while reducing pollution, restoring biodiversity and making the world a safer place for all: all worthy goals and potentially all achievable. Much good work is quietly going on, but so very much more could and should be done. Political leadership and media support have been the missing ingredients. The BBC giving Hans Rosling a slot in the run-up to the New York summit was a rare exception, and the sort of thing we could do more of. This entry was posted in Global, Politics on 28 September 2015 by Richard. The idea that hydrogen would replace fossil fuels has been around for a very long time. In 1923 J. S. B. Haldane gave a famous lecture at Cambridge predicting that wind power would be used to separate water into oxygen and hydrogen via electrolysis, and that hydrogen would provide storable energy, to be used as and when required to drive industry, transport and the whole economy. There have over the decades been many technological developments, and hydrogen fuel cells are used in a huge range of niche markets from fork lift truck to submarines. So far there has not been a massive switch from fossil fuels to renewably generated hydrogen for mainstream transport and power. Is that about to change? 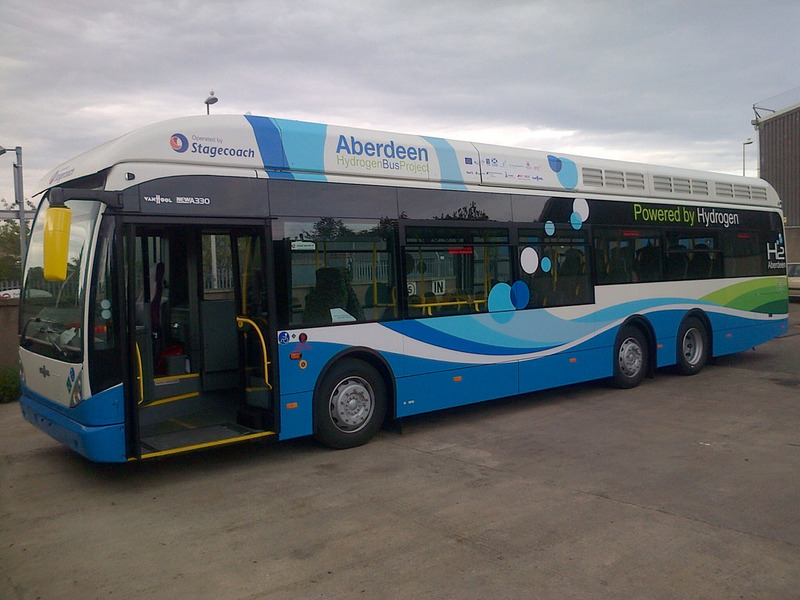 In March this year Europe’s largest hydrogen bus refuelling station opened in Aberdeen, with 10 new hydrogen fuel cell buses. At Junction 33 on the M1 in South Yorkshire ITM Power has just opened the first publicly accessible hydrogen car refuelling station with an on-site wind turbine producing the hydrogen on-site. The same company are also opening a solar powered hydrogen refuelling station on the A13 in Essex. ITM are also now working with European Marine Energy Centre in the Orkney Islands, where they’ll be making hydrogen from tidal energy. Last October I blogged about Frankfurt installing ITM’s impressive wind to power via hydrogen technology, in August I blogged about Qingdao Sifang producing the world’s first hydrogen fuel cell tram, and several times on this blog I’ve sung the praises of the Riversimple hydrogen fuel cell cars, that should soon be in production. Globally the technology giants are moving toward hydrogen. In October the sixth World Hydrogen Technologies Convention is due to open in Sydney, Australia, where Toyota is promoting the hydrogen powered Mirai, the first mass production hydrogen fuel cell car. Lots of other developments are happening all over the World. All these are encouraging signs. Perhaps it is too early to claim that the fossil-fuel era is over, but the indications of a better, less polluting technological basis to a new kind of economy are emerging. Renewable energy will be at the heart of these changes, and hydrogen fuel cells will be one of many important supplementary technologies. This entry was posted in Energy, Transport on 22 September 2015 by Richard. As the above graph shows of the EU 28 only the Netherlands, Malta and Luxembourg produce less of their total energy from renewables than Britain. Since the election the Tory government has made a concerted attack on renewables, energy efficiency or any effective action on Climate Change. The Zero Carbon Homes standard has been abandoned, the Green Deal was a shambles, the reduced road tax for low emission vehicles has been axed, and support for onshore wind and for solar power has been massively reduced while money is being pumped into fracking and offshore oil exploration. Globally the arc of history is trending firmly towards energy efficiency and renewables. Fossil-fuels are history. Investments in them will become stranded assets. Britain is going in the opposite direction from most other countries. In fact it is only England and Wales, as an independent Scotland under the SNP would pursue a much more Scandinavian socially egalitarian and renewables driven economy. Nuclear power seemed to some people to be a necessary part of a low carbon economy just a few years ago. Some people still hold this view, yet even France, traditionally the most pro-nuclear country on Earth is now turning against nuclear in favour of renewables. The emerging way the electricity grid operates will be dominated by distributed renewables, powerfully interconnected and much more like the internet and the cloud than the old centralized grid. Baseload power stations like nuclear or coal are obsolete. What is needed is flexible, dynamic, nimble load balancing capacity which will take many forms including increasingly renewably generated gases, pumped storage hydro, distributed batteries and a range of other technologies best suited to fit with a wind and solar dominated grid. People used to believe that renewables could only provide a small percentage of electricity or the grid would be subject to instability, I recall figures as low as 7% being quoted many years ago. On the night of Thursday 9th July 2015 Denmark produced 140% of its total electricity from wind power, exporting the surplus to Germany, Norway and Sweden. Huge numbers of British people want a modern efficient European renewables based economy, diametrically opposite to where this government is taking our country. Craig Bennett, the new CEO of Friends of the Earth, sees that organisation being forced into a much more confrontational relationship with governments than it has had for much of the last few decades. I tend to agree with him. This government really is beyond the pale! I’ll be taking my message about the positive possibilities about what this country could be doing, and highlighting some of the really good stuff that is going on both in Britain and more especially elsewhere as humanity steps up to the challenge of Climate Change, and the myriad forms of pollution of which it is but one aspect. I’ve three talks coming up in and around Herefordshire in October, see the ‘Talks and Classes’ page of this website for details, or book me to come and give a talk in your town or village. Technologically and philosophically there is just so much we could be doing, and in some places are doing, to secure a better future. This entry was posted in Energy, Environmental, Politics on 12 September 2015 by Richard. Trianel Windfarm: The worlds largest community owned wind farm. In Britain we are caught up in an outdated debate about whether services, from the health service, to banks, railways or the energy infrastructure, should be nationalized or privatized. Neither of these models seem ideal to me. We in UK have much to learn from our European neighbours who have a much more pluralistic, localized and democratically controlled mix, with a huge ‘not for profit’ sector. Germany and Sweden both, at least to some extent, followed Britain in the 1980’s fashion of privatization. Now they are both undergoing a process of ‘re-communalization’. When I was working in Frankfurt last year I was impressed by Mainova, the local municipally controlled provider of electricity, heat, gas and water. Many German cities and some smaller places have their local Stadtwerke, municipal organisations that run a huge range of local services and feed any profits back into long term local investments usually with a range of social, economic, ecological objectives. In Britain we’ve been hampered by a short term profit maximizing privatized industry since the 1990’s and before from 1946 to the 1990’s by an over-centralized and remote nationalized industry. In the 1930’s we had a greater municipal sector, which it might be time to revive, along with a whole raft of new coops and international joint projects. A recent academic study comparing the German and British systems of finance and ownership of energy infrastructure by Hall, Foxon and Bolton is well worth reading. It shows the extraordinary range of difference between the German and British systems. A vast range of local ‘not for profit’ banks and energy organisations are at the heart of the German Energiewende. Here is one example. The first phase of the Trianel wind farm Borkum has just opened. This is a 200MW plant, with another 200 MW due to follow soon in phase 2, making it by far the biggest community owned wind farm in the world, with an estimated total cost of 1.3 billion Euros. The ownership and financing are utterly unlike anything we are used to in Britain. It is owned by 33 local municipal utilities, mainly owned and controlled by local city and town councils spread all across Germany, Holland, Switzerland and Austria. Collectively they formed Trianel to develop a rapidly expanding portfolio of energy infrastructure. They are supported by a huge range of banks, many themselves locally controlled, democratically accountable and in the not for profit sector. Trianel’s membership is expanding so in future many more than the current 33 cities might be stakeholders in ever more ambitious energy projects, which increasingly will be low carbon. Can we imagine British cities having the organisational capacity and ambition to join-in? Let’s hope so! This entry was posted in Economics, Energy, Politics on 3 September 2015 by Richard.